Banting...a word I haven't heard uttered once since I arrived back home in the U.S. in March, and yet one that I'd hear at least five times at any gathering in South Africa that involved two or more women. Oh, how I miss that Banting banter. To put it simply, Banting is a way of eating, one that's taken South Africa by storm over the past couple of years. I wouldn't consider it a diet, seeing as you're meant to adopt this method of eating for life. It was made famous by Tim Noakes, a South African exercise and sports science professor at the University of Cape Town. The man is a bit of a legend...having run over 70 marathons and ultramarathons, he knows his stuff, so when he wrote his most popular book to date, The Real Meal Revolution,people listened. The book hasn't been published in the U.S. as of yet, but is set to release on July 30, 2015, so make a note in your handy little iCal and plan to Amazon.com that baby. Banting supports a low-carbohydrate, high-fat (LCHF) diet, and is described as "a long-delayed return to the way human beings are supposed to eat" (Source: Amazon.com). It gets rid of the myths that fat and cholesterol are detrimental to our health, using solid scientific research and hard evidence to back these claims. You're allowed meat, seafood, eggs, cheese, butter, nuts - many things that are the first foods to be smacked away by other popular diets. When I lived in South Africa, I was able to experience firsthand what it meant to say, "Oh, sorry, I can't have that, I'm Banting." Everyone immediately knew what you were talking about. No grains or sugar for you! Markets had signs labeling certain foods as "Banting-friendly!" and some restaurants even had separate sections in their menus for "Banters." Tim Noakes claims that Banting can help do away with a plethora of health issues, including weight gain, low energy levels, high blood pressure, even certain skin conditions. In The Real Meal Revolution, a good half of the book is dedicated to the science and history supporting this style of eating, with evidence and studies carefully cited. The other half is devoted to some (pretty damn delicious) recipes that are all Banting-friendly. Without going into the details of my own personal food philosophy, I have to say many aspects of the Banting diet make sense and appealed to me. 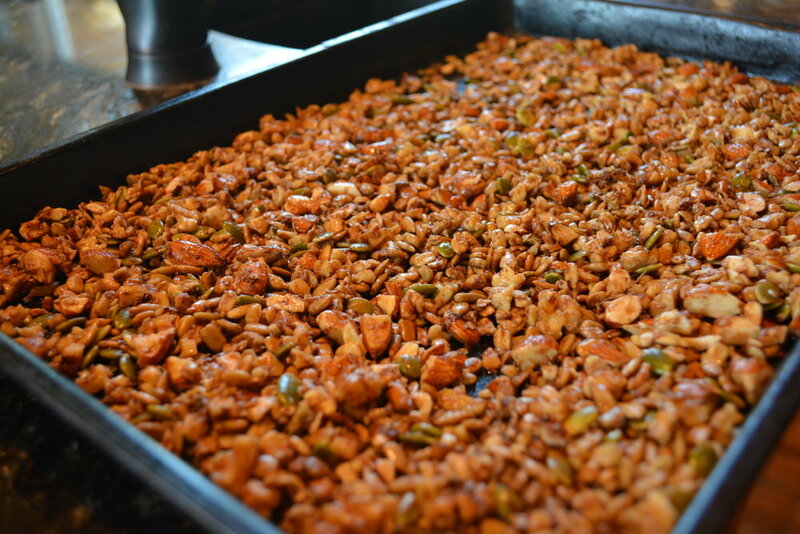 This is one of my favorite recipes out of the book: a grain-free granola based on nuts and spices (no oats, other grains, cane sugar, nada). And, as a bonus, I knew this granola would immediately propose to my favorite plain full-fat greek yogurt, and a happy breakfast wedding would occur. The recipe is also incredibly simple, and under 30 minutes from start to finish! 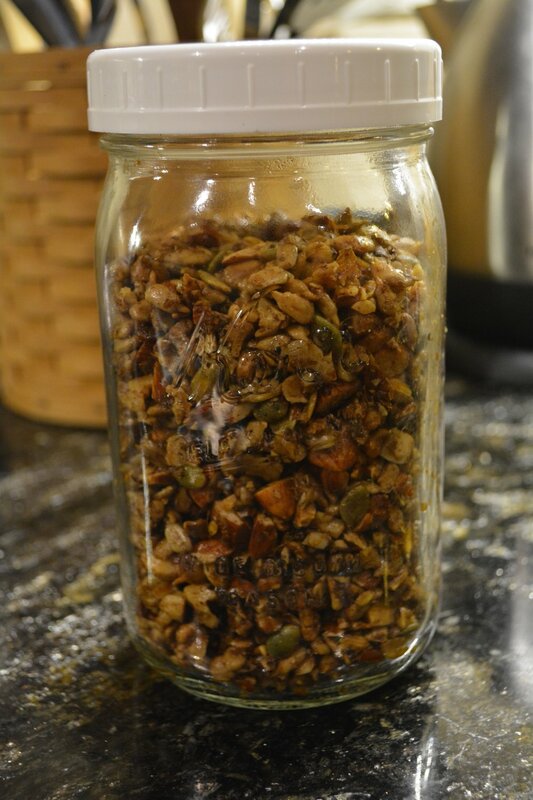 Give it a go, and let me know if you come up with any creative uses for this granola. There's bound to be bunches. Feel free to mix up what nuts and seeds you use! Optional: Any other nuts/seeds you want to add (pecans, pumpkin seeds, etc.) 1 tsp vanilla 1-2 tbsp honey/agave/maple syrup to sweeten, if you're into that! It's not exactly Banting at this point, but it will taste absolutely fabulous. 1) Preheat oven to 325 degrees F (160 C). 2) Chop the nuts up roughly and mix them all up in a bowl with the seeds. 3) Melt the coconut oil over a medium-low heat in a nice big frying pan, then add all the spices and swirl them around. Be careful not to burn them! If you're using sweetener or vanilla, add them to the pan at this point. 4) Add the nuts to pan and toss them around until everything is all nice and coated in coconut-y spice-y goodness. 5) Remove from the heat and smooth the nuts out onto a baking tray in an even layer. 6) Pop the tray in the oven and bake for around 10 minutes - just enough to give them a nice little roast. Be warned: it will start to smell like Christmas. Don't blame me if you get the urge to put on a little Josh Groban Noel. 7) After 10 minutes, remove, let the nuts cool to room temperature, and store in a cute little mason jar (or any other container, but I love me some mason). 8) Eat it however the heck ya want! Top your yogurt, eat it as a snack, mix with some fruit...pick your poison (that's just an expression, it'll actually do your body wonders), and enjoy the wonderful effects of a nutritious, full-fat, Banting breakfast. Make note of the fact that you don't get those annoying cravings mid-morning - no donuts for you. You should feel nice and full right up to lunch time.